Happiness is a decision. Do you believe that? According to Andrew Mathews in his book ‘Being Happy’ ….“It is not what happens to us in life that determines our happiness so much as the way we react to what happens”. Happiness is a topic least talked about, yet it is critical for wellbeing. The workshop Happiness for Life is designed to inspire people to take responsibility for their happiness and learn ways to look at life positively. The Happiness for Life workshop is for community and business groups. 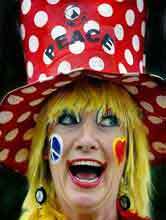 The workshop is presented by Peacefull the Clown aka Susan Carew, who shares a clowns perspective on happiness. Peacefull was invited to Russia with Dr. Patch Adams and clowns regularly in hospitals, the streets, in schools and overseas to inspire positivity and happiness. The workshop design is part theory and part practical to action and integrate happiness in our lives, work and community. How do we create happiness?